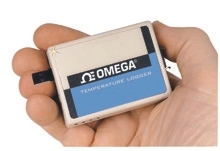 The OM-SP is part of OMEGA’s NOMAD family of low cost portable data loggers. Models are available for Temperature, Temperature and Humidity, AC current and Universal Process input. All models share a rugged compact form factor small enough to fit in the palm of your hand. Their precision 12 bit analog to digital converter insures accurate readings no matter what input type. All models are compatible with an optional easy-to-use Windows software package that allows the user to configure the data logger, download, display and save the stored data.